No matter what kind of hydraulic equipment in Chino CA you may have, you can bring it to Bernell Hydraulics for expert attention. We’ve been in business since 1977 and in that time we’ve seen–and helped fix–just about every hydraulic problem imaginable. Here is an overview of the major services we offer. Time is money in virtually every field, and the industries that utilize hydraulic equipment on a daily basis are no exception. 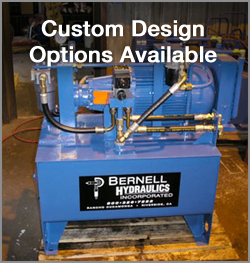 If your hydraulic equipment isn’t performing like it should, call Bernell Hydraulics right away. We’ll send expert mobile technicians to your aid 24/7 to help get your equipment back up and running as soon as possible. You can count on us to provide a reliable, long-lasting repair because we use quality parts and we test our work before signing off on any job. Hydraulic parts sales are a big part of our business. We can provide parts and installation, or just parts if you are confident enough to repair your own hydraulic equipment in Chino CA. As an authorized ParkerStore, our Parker offerings are especially strong. However, we also carry a wide variety of parts from other trusted brands such as Lion and Monarch. Call us and have us ship the parts to you, deliver them to your worksite, or pick them up yourself at one of our stores. When it comes to keeping your hydraulic system in top working condition, regular inspections and routine maintenance are key. We can help you evaluate older hydraulic systems and determine what upgrades or repairs might be needed. We can rebuild your old pumps, valves, cylinders, and motors, or fabricate new custom parts for you in our workshop. And, of course, we also offer routine maintenance services like fluid analysis, drain and changes, and filter replacements for your hydraulic equipment in Chino CA.